No, I’m not recommending dehydration. Enjoy water, juice or soft drinks. I know. I’m no fun. I’d rather see you enjoy healthy relationships than have fun. Actually, I had a blast dating and I never touched the stuff. You can too. 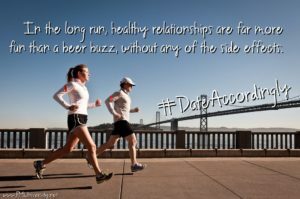 In the long run, healthy relationships are far more fun than a beer buzz, without any of the side effects. Aren’t I the terrible no-good very-bad party pooper? Well maybe, but regardless, for your enjoyment I present the TOP10 Reasons Why You Shouldn’t Drink and Date! 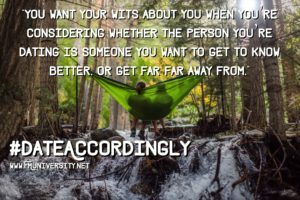 #10: Alcohol impairs judgment and don’t you want your wits about you when you’re considering whether the person you’re dating is someone you want to get to know better, or get far far away from? #9: You want to know whether you truly feel relaxed around your date, or if it’s just the rita. #7: You don’t want to run into your date the following week and have them thank you for the teeth marks you left in their shoulder blade. As they show them off to their friends in front of you. 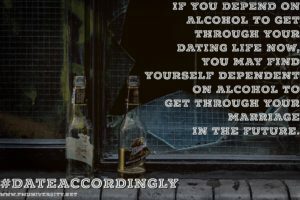 #4: If you depend on alcohol to get through your dating life now, you may find yourself depending on alcohol to get through your marriage in the future. Not a standard you want to set. 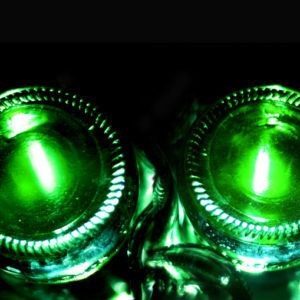 #3: Drinking says something about you. Depending on your date that “something” might be good or bad. Regardless, why not let your mouth do the talking. #2: Speaking of talking: slurred speech is NOT a turn on. For more on what it takes to date differently and SUCCEED visit our Hot Topic page dedicated to dating.